What percentage of your sales come from repeat business versus first-time customers? Consider how much you spend for customer acquisition versus customer retention. If you are like most organizations there is an significant disparity between these numbers. With advent of social media, your customers, now more than ever, have the power to drive new first-time customers to your organization through their testimonials and recommendations. It seems appropriate to consider reshaping marketing and sales strategies to refocus more attention on your current customers and all the associates that collectively support your customers. Your customers and associates are your organization’s greatest assets! Event Design International works with organizations to build relationships with customers, associates and prospects through meaningful events. Incorporating meaningful events into your strategy is an excellent way to build those relationships.Meaningful events allow for your customer, and prospects to communicate one-to-one with people in your organization who are knowledgeable, who can provide solutions, can offer advise or be a sounding board for new ideas. This cannot be accomplished with sales promotions, web marketing, direct mail, print or broadcast advertising. According to MPI Foundation’s “Event View 2009” a survey of 920 marketing managers in North America, Europe and Asia Pacific, Event Marketing is the marketing element that provides the greatest return on investment. EDI will work in partnership with you to promote brand awareness with the various intellectual and design resources we have available, as well as our years of experience. We will help you build relationships with customers, prospects and associates through meaningful events. 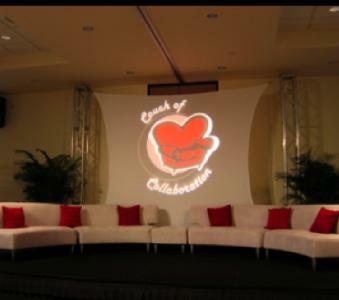 The photo above represents the staging we put in place for a Fortune 500 company that had adopted their meeting theme as “Couch of Collaboration”. The Company used the staging as a platform to present the concept of teamwork. Skits were performed and presentations made which reinforced the need for collaboration. The participants formed teams according to their brand and worked in partnership to solve challenges presented to them. The participants also had an opportunity to have their team photo taken on the “Couch of Collaboration” by EDI Digital. The photos were printed on site and distributed to the individual team members as a keepsake of their experience and reinforcement of the theme. Each quarter EDI produces a "Beauty Break" for the employees of a consumer products company. The Beauty Break not only provides a break for the employees from their work routine but expands the employee's view of beauty through the presentation of various aspects in our lives (i.e. fashion, the five human senses - sight, smell, taste, touch and hearing, community support, beauty within). The video is an excerpt from Saks Fifth Avenue's presentation of the "View of Beauty Through Fashion". Procter & Gamble's brandSavers business segment celebrated their 5th anniversary with an outdoor luncheon event for 2,000 employees, entertainment and of course a giant cake cutting.